The Me to You Clear stamp set and decoupage paper are a must have for any Easter project. 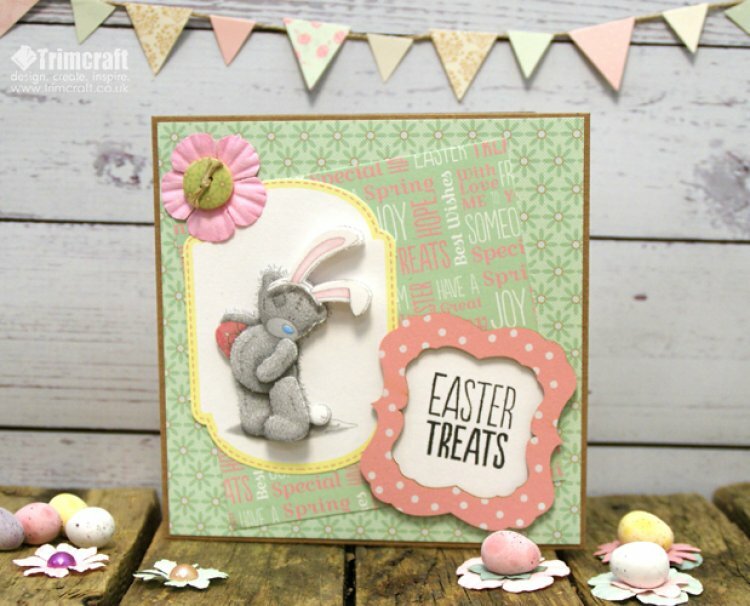 Our Easter Bunny Card Tutorial is a quick and easy way of using both. 1. To make your Easter card, cut a piece of the Me to You Easter Premium Papers green floral paper 14.5 x 14.5cm and stick to a blank piece of 6x6 kraft card. 2. Cut the green sentiment paper 12 x 12cm and stick on the card at an angle. 3. To layer your card, use the Me to You Easter decoupage topper and add to the left side of the card. 4. Pick your sentiment text stamp, press on a small white card and place under a wooden frame, using glue to keep secure. Add the wooden frame to the bottom of the card. 5. As a pretty finishing touch, add a paper flower and wooden button to the top left corner to finish. This versatile card design can be used for any occasion, just change your sentiment stamp to suit your theme! Have you made your Easter cards yet? Why not share them on the project gallery?